Indigenous fisherman in the U.S. claim to have captured more than 43,500 farmed salmon. 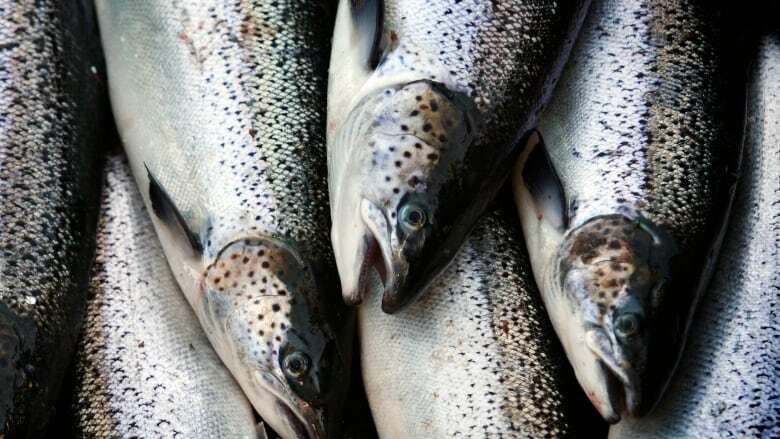 Escaped farmed Atlantic salmon have swum as far as 250 kilometres north of Washington state's San Juan Islands, where they broke free from a ruptured pen last month containing an estimated 305,000 fish. The non-native species of salmon have been reported as far north as Tofino on the west side of Vancouver Island and Campbell River on the island's east side, according to Byron Andres, head of the federal Atlantic Salmon Watch program. "Quite a distance. I'm not sure whether we should be surprised by that but they have travelled further than I initially anticipated," Andres told Gregor Craigie, host of On the Island. Since the spill on Aug. 19, Fisheries and Oceans has fielded about 40 reports of Atlantic salmon in B.C. waters. Meanwhile, Indigenous fisherman with the Lummi Nation in Washington State claim to have caught more than 43,500 of the fish, which are classified as an invasive species in the U.S. While none of the recent 40 reports have been confirmed, Andres said the department is relying on the public to help track the movement of the fish while it prioritizes recovery efforts. Fishers are asked to keep the carcass or head of any Atlantic salmon they catch and to give the parts to officials. "If they could preserve the head and the gut content so that I can recover that from them, we have some analysis we'd like to do with that tissue," Andres said. The stomach contents of the fish will be analyzed to determine how effectively Atlantic salmon have been able to feed in the wild while the heads will be used for identification purposes. Will escaped Atlantic salmon survive — and thrive — in B.C. waters? Specifically, scientists are looking for otolith bones, inner-ear bones that retain a unique signature specific to the farm they originate from and help trace farmed fish back to their source. Otolith bones grow in layers over the duration of a fish's life. When a fish is in the hatchery, water temperature is controlled to affect how the bone grows which creates a "thermal imprint" on the otolith. "They increase and decrease the temperature of the water so that the otolith is laid down in a very distinctive pattern like tree rings," he said. "It could be done with DNA as well but the otolith is much cheaper." The incident ignited debate surrounding controversial farming of Atlantic salmon in B.C. and prompted Indiginous groups to occupy two B.C. fish farms. The B.C. Salmon Farmers Association said escapes are rare north of the U.S. border because farms here are built to a higher standard than in the U.S. The company the salmon escaped from blamed high tides, currents and the coinciding solar eclipse for the collapse of the pen. But the site near Cypress Island was experiencing structural problems about a month before the collapse and was slated for upgrades, according to Cooke Aquaculture.